Neville Canton is about as average as any man can be. He has a mediocre job, a pleasant wife, and an ongoing feud with his sister. He thought he was destined for great things in life, but unfortunately never got a real shot. Once all the excuses dried up the cancer finished the job. With the help of a spiritual guide, he navigates through seven challenges; seven tasks to sever his final connections to the mortal world. Interesting concept with some relatable moments, though, a bit depressing. The narration was okay but it didnt seem like the voice matched the character. “Lost In The Clouds” is an interesting tale of one character’s personal growth. Instead of that growth coming in life, like most stories, this one comes after death. Poor Neville has just passed away, but he can’t move on. He’s stuck without a clue until his spirit helper, so to speak comes along to help guide Neville. “Lost In The Clouds” is more of a small story. It certainly isn’t something to be told on a grand scale. But it is worth your time. Finally, this audiobook was provided by the narrator at no cost in exchange for an unbiased review, courtesy of Audio Book Boom. Neville is quite the ordinary man, neither a saint nor a devil. He’s got some hangups but also some righteous anger. As he drifts in the in-between, he’s guided by a rather blunt, grumpy man. Neville has to face all the things he loved and hated in life and one by one let go so that he can move on to the next stage of existence. Not much happens in this book. It’s a quiet, personal, and emotionally challenging journey for Neville and us readers are just along for the ride. In this sense, I would compare it to some of Guy Gavriel Kay’s books where the story is all about a character’s personal growth. Honestly, at first I wasn’t too sure where this tale would go but I was hooked on Neville and really wanted to see what he would make of it. Perhaps half way through the tale we learn more about Tessa, Neville’s older sister, and why he holds such anger towards her. I really liked this scene because it gave me both sides of the larger issues that stood between the two. They both made mistakes and they both had to pay for them. Neville’s bland wife Catherine wasn’t all the interesting. We only get small snatches of her, seeing how she’s done her best to support Neville emotionally throughout the years. I would have liked more about her because I’m pretty sure she had hobbies or friends or personal tribulations. A few more minor characters come into play. Dennis is the office parasite. There’s a memory of Neville’s dog Wilbur. There’s also a lovely lady at the office that could be Neville’s friend or his undoing. The cast was pretty small for this book and I think that makes it ideal for a stage play. There were a few times when the story lagged a little for me. I felt that Neville had made his point but then slid into the Whiny Zone. The first time, this was part of his character but as he did it more and more often, I became a little tired of it. On a side note, as Neville fades in and out of life throughout this book, he often mentions tingling in his personal bits. Yep. Honestly, after the second time it added a little humor to the tale. Neville’s nethers are tingling again! Perhaps it’s just me or perhaps the author was trying to work in a reference to Neville’s root chakra. All together, I was entertained throughout the book. The tale has some weight as Neville confronts his own shortcomings and overcomes them. This is a small, quiet tale that left me with some deep thinking to do. Narration: Kyle Tait was a perfect fit for this book. He was great as Neville, capturing the often subtle emotions of this character. His female voices were also believable and all the character voices were distinct. I especially loved his voice of the grumpy guide that Neville is plagued by as he transitions from the living to the after life. Neville Canton had an average life, and unfortunately, died of cancer. This is the story of his pass to the afterlife, of the trials he will have to overcome to avoid getting lost in the clouds. I think this is a very personal book. The afterlife and the journey towards it has a different meaning to everybody. This books is kind of original in the way that it proposes different kinds of ordeals than the ones we are used to. While I enjoyed the story, I think I was not able to get all the meaning Gold had pour onto it. it could be that I don't really believe in anything like this, or just that the story kept me expecting something... else. I did enjoy Kyle Tait's narration. He really became Neville in this story, and was also good with voices. I just found the spiritual guide's a bit overdone. For the rest, his voice is clear and his audio production skills are very good. I am not sure if I could recommend this book to anyone. I think it will be enjoyed by those with an open mind and who believe in the afterlife. 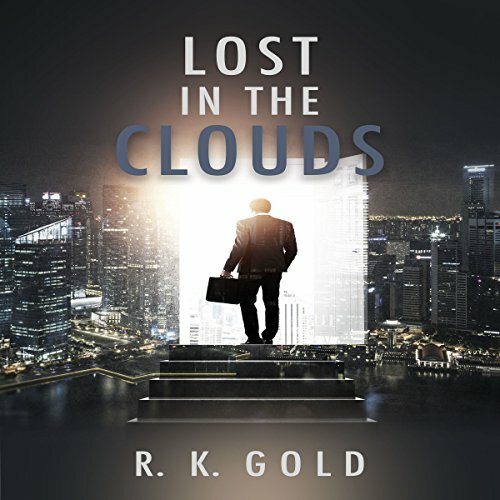 Lost in the Clouds by R.K. Gold was a good read. Neville has sucuumed to his cancer but it isn't the end of his story. He has to find his way to the afterlife with the help of a spiritual guide. I have read all of R.K.'s books so far and each one brings something different and unique to the table. First there was a living forest with a guardian demon, then a religious cult survival thriller and now a mystical journey between life an death. As I journeyed through the story each of the tests that our hero undertook became more convoluted. Not a negative for the reader but as a difficulty for Neville. From straightforward to temptation that he didn't realize was leading him astray. For a story about some random dude in a cloud, the character development is incredibly deep. What's more is that it's not just developing the character of Neville but the character of every individual who at some point must go on this journey. Sure there is buy-in to Neville himself as you discover his backstory and type of person he is, but it is more that we as the reader get a deeper glimpse of what may await us in the in-between and what actually matters in life as we know it. The guide was fantastic and you are always guessing at what his actual deal is (in a good way). It is terrifying to imagine this journey alone and the guide brings some levity (and creepiness in a fun way) to the dire situation. Again, this is a quick read/listen. You will be able to crank it out in half a day give or take but the length takes nothing away from the story itself. I have high hopes for this writer and I cannot wait to see what comes next. Also, I am kind of hoping the guide and the demon are connected in some way. I know not every writer has their own universe connecting everything but these two characters are fantastic and would love to learn more about them. Highly recommend this for anyone who enjoys the mystical, metaphysical, magical or just enjoys a good read. This was an interesting and creative take on what happens after you die. It is definitely different and unusual from anything I have listened to before. The synopsis sounded really intriguing and even though it was entertaining and interesting overall, it just wasn't for me. It felt like it had that "dream" quality at times. You know when you have a dream and most of it makes sense then all of the sudden it takes a left turn and it just seems odd and confusing. I'm sure there is some deeper meaning/insight to the story that just flew right over my head. Honestly, it seemed like some kind of weird hallucination acid trip. ( I'm basing that on what I've heard not from personal experience). Evidently the space between death and the afterlife can be a strange adventure for some depending on what earthly connections you need to cut and what final business you need to take care of. Hopefully when the time comes my trip will be much more dull and peaceful than Neville's. Kyle Tait did a really good job with the narration. This is the first time I have listened to him narrate a book. Nice voice that is easy to listen to for long periods of time. Clearly spoken with a nice even pace. Great character voices. His voice for "the guide" was great. A bit creepy. But it gave him a distinct personality. He was able to bring the story and characters to life. Very enjoyable. I was given this free review copy audiobook at my request and I voluntarily provided this review. This is a story of a man that dies and then has to struggle through different scenarios to figure out the unresolved issues in his life before he qualifies to move on to his eternal reward. The representations in the book were sometimes confusing and I couldn't relate. While there was something interesting story elements and parts to ponder, I don't feel the author ever successfully engaged me into feeling a part of the story. It felt flat. I was given this review copy of this audiobook at my request in exchange for an honest and unbiased review. At four hours, this is a fairly short book. I bring that up because that actually seemed an appropriate length for this one. It is a book about the after life, or what happens after you die. The main character is somewhat relate-able, but kind of depressing. The whole book is just kind of sad and depressing. Like a gray haze across an otherwise colorful story. I'm unsure if this was intentional by the author or not. I didn't hate this book, but I can't say that I liked it either. It kept my attention the whole time, and the narrator did a good job, but I don't know that I would have kept going if it was any longer. I enjoyed this but I'm not sure why. The narration was good and brought out the different characters nicely. The story I found just a little confusing. Perhaps I would have done better to listen while I wasn't driving. I had to listen to the end to find out what happened and I'm glad I did. But I'm still feeling a little confused. This was a brilliant novel, following a man (Neville) after his death and his attempts to cut his ties with his life and move on to the afterlife. I loved the premise of this novel, the writing, the characterisation, everything. It was extremely well written and I especially loved the scenes between Neville and his wife. In the blurb they're described as average and pleasant, but you could really feel the love between them and the heartbreak when Neville had to chose to let her go in order to move on. I loved the journey that Neville travelled in this book and I thought that the ending really befitted the plot.